Shiveluch (Kamchatka): Seismic activity has decreased, classified as weak by KVERT. This suggests the active dome is in a phase of relative calm. Tolbachik (Kamchatka): No end of the eruption is in sight. Lava continues to be erupted from the southern fissure. KVERT reports no significant changes and tremor levels have remained stable over the past 2 weeks. Sakurajima (Kyushu, Japan): The volcano is back to about 1-2 explosions of moderate size per day. Manam (Papua New Guinea): Ash plumes at 8,000 ft (2.4 km) altitude and extending to the NW were observed on satellite images (VAAC Darwin). Veniaminof (Alaska Peninsula, USA): Activity has continued over the past days with little changes. Direct observations are difficult, but for the first time, some incandescence from the central cone was observed on the webcams yesterday. This is likely due to the presence of a lava flow and/or spattering from a vent. "Volcanic tremor continues to be detected in seismic data indicating that the eruption of Veniaminof Volcano continues. Satellite images obtained over the past 24 hours show elevated surface temperatures at the intracaldera cone and earlier today a plume was observed extending to the southwest from the cone. The plume was probably generated by the interaction of lava with snow and ice and probably consisted mostly of water vapor and possibly small amounts of ash. Views of the volcano from the web camera in Perryville did not show any obvious ash clouds, although images obtained just before sunrise showed a small area of incandescence on the intracaldera cone consistent with the production of small amounts of lava and or spatter. Pavlov (Alaska Peninsula, USA): The eruption continues at low levels. Seismic tremor and occasional explosions are being detected in seismic data and indicate that minor ash emission is likely occurring, although no ash plumes were detected on satellite data over the past day. 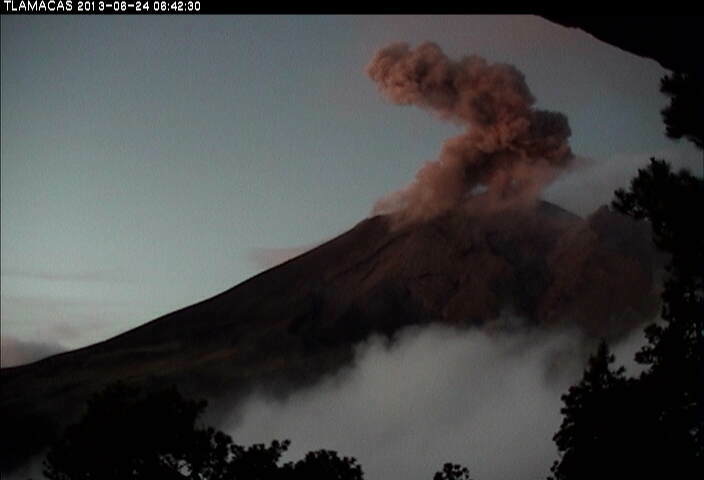 Popocatépetl (Central Mexico): The volcano has remained at moderate levels with frequent but mostly smaller gas-steam-ash emissions at a rate of approx. 3 per hour. Plumes reached about 1 km above the crater. According to a local press article, some US airlines (United, AA) decided to temporarily use alternative airports instead of Mexico's International Airport (AICM) as a precaution against encountering ash. AICM itself reports that so far no ash so far has been detected at/near the airport.